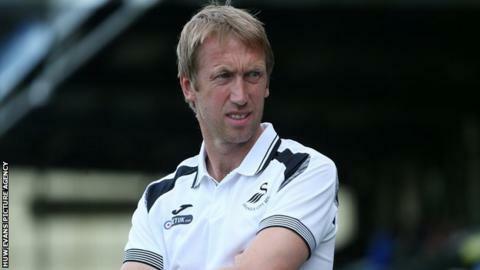 Swansea City have lost both their Interwetten Cup matches, against Genoa and FC Magdeburg, on penalty shootouts. Following a 1-1 draw against Serie A side Genoa, Kyle Naughton and Jordi Amat both missed penalties as Swansea lost the shootout 4-3. It was a similar story against hosts Magdeburg later in the day as Graham Potter's side lost a shootout 4-2 after a goalless 60 minutes of play. Both games were made up of 30-minute halves instead of a full 90 minutes. Potter fielded entirely different sides for the two matches. Ghanaian forward Andre Ayew featured against Magdeburg despite interest from Turkish side Besiktas. There was also a start for Jefferson Montero, who has returned to Swansea after a season on loan at Ecuadorian club Emelec.